Our 'ready to fly' Hot Air Balloons are great for use in Wedding Parties, 4th of July Events, New Years Eve Parties, Meteorology Experiments, and general research - not to mention just plain fun. 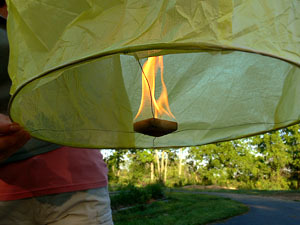 Made of fireproof tissue paper and wire, these lightweight Hot Air Balloons come complete with a long burning fuel pellet (see images below) which provides heat to lift the balloon for 5 to 10 minutes. 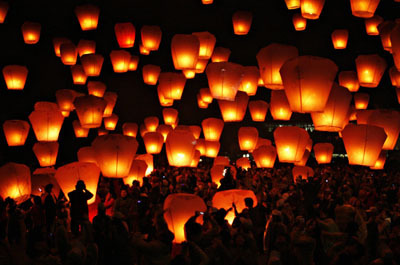 The semi-transparent balloons are absolutely stunning at night where the light of the flame makes the entire balloon glow the color of the tissue paper. Balloons come in Yellow, Blue, Orange, Red and Pink. 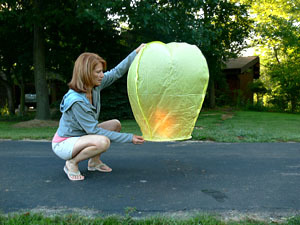 Balloons are shipped in a flat package and when unfolded, simply snap on the fuel pellet and light. 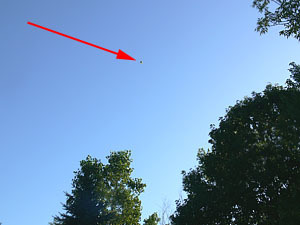 In about 3 minutes or so, the heat from the pellet will expand the balloon and it will begin to tug upward wanting to fly. These balloon will fly to amazing altitudes and distances. 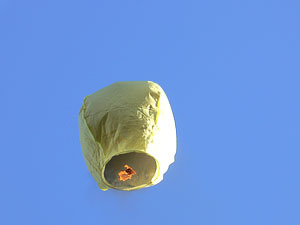 Fuel pellets are designed to burn out before balloons reach the ground however they obviously should not be launched in flammable areas or on high wind days. The ideal conditions are dark, still nights where the balloon with brightly glow and eerily lift off in complete silence. Launching several at a time is a beautiful sight to see. 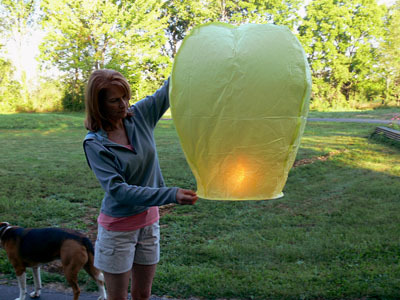 You might want to inform your neighbors before you launch one of these at night to prevent them from calling the police and reporting a UFO invasion. Balloon Fuel Pellet after ignition. Balloon filling with hot air. and problems of the newly married couple. Balloon lift-off at a large wedding party.